Here’s a band I’ve been meaning to write about all year. 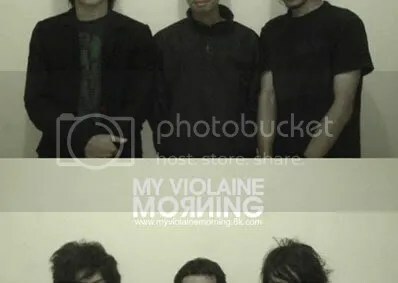 My Violaine Morning are truly a wonderful addition to the shoegaze and post-rock genres. They formed in 2004 and released their first EP Where’s My Place to Play in 2007 for free via Grotesque Records, which earned them listeners far outside their home country of Indonesia. With its swirling guitars, distorted sounds and sweeping vocals the five track EP touches on influences like Explosions In The Sky, Slowdive, The Cure and Cocteau Twins. In other words a goldmine for fans of any kind of dream pop. Though originally a quartet, My Violaine Morning now consists of three members: Rony (guitar; vocals), Kiev (bass; vocals) and Risky (drums). The band is currently working on their first full-length album which hopefully will be completed in February-March of 2009, as well as preparing live shows in Bandung. For a taste of the up-coming material head over to the band’s MySpace where you can stream their latest single “Ceuraniouvle”.